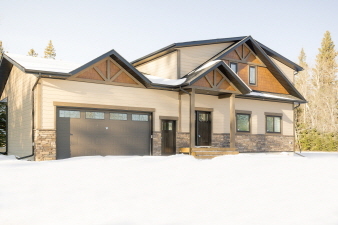 Beautiful BRAND NEW Craftsman style home backing the 6th hole of the Candle Lake golf resort. Fully furnished 1888’ 3 BD, 2.5 bathroom dream home featuring large front entryway with lockers, spacious kitchen with espresso cabinets with island & granite counter tops, dining area with custom made farm house style table, benches & stools with one of a kind country style chandelier over dining room table. Vaulted ceiling in main level, large living room with all of windows overlooking back yard & golf course with 2 way (inside/outside) gas fireplace face in the living room with door to huge covered back deck. Main level master bedroom with 5 pc bathroom, huge walk in closet with ample built in shelving & drawers and 2 pc bathroom & laundry room complete the main floor. Upper level features cozy family room loft, 2 BD’s & 4 pc bathroom. Amazing wood work throughout, giving this home a lovely Southern yet contemporary feel. Additional Features and Amenities Appliances all included: Fridge, Stove, BI dishwasher, Washer, Dryer & Range microwave/ hood fan included. Central AC. Professionally landscaped yard with underground sprinklers. Large 1/4 acre lot, move in and enjoy the good life! Large double attached garage, with 13’ ceilings, direct access to house and wheelchair access. Walking distance to the lake.